If this doesn't make you nervous, it should. I also noticed that my interview with the president went down like a Lead Zeppelin. I promise to refrain from anymore funny business. Big news, Leaguers! As you may have heard, President George Bush has decided that the National Media have not been giving his Iraq plan a fair shot. Hence, the Prez is seeking local and alternative media outlets to get his message across. 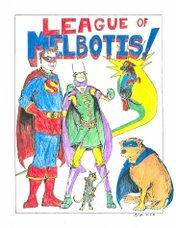 And what better forum than The League of Melbotis? None. And that's why I went ahead and decided to break from my usual non-political MO and do some time with W.
LOM: So, Mr. President, you're also a former Austin resident? Prez: I am. I am a former resident of the Governor's mansion. LOM: Wasn't it noisy down there? That's a high traffic area. Prez: It was noisy, but we had a wall. A wall which kept out sound. LOM: Rad. We have those in Arizona, but I can't tell if they help. Mr. president, the Governor's mansion is a big house. While governor, did you help clean the mansion? Prez: No, no I did not. We had many maids. We had many maids who were highly trained professionals. We had found that by simply leaving my socks on the floor, I was creating jobs for hard working Americans. LOM: I hear your daughters like to party. LOM: I used to work at UT. Prez: Oh. HA HA!!! Hook 'Em! Heh heh. Heh heh. heh. Yeah, they like to get out. I say, "Bring 'em on!" Heh heh. Prez: While in Austin, did you ever go to Mary's on South Lamar? They had breakfast tacos. Tacos which were for breakfast. But often, I would get tired of waiting in the line. The line for tacos. LOM: I mostly went to Casa G's for breakfast. Less waiting. Prez: I enjoyed their... their chimichanga. LOM: I never had it. Prez: It's a fine chimichanga. Especially with extra cheese. LOM: I like the chicken enchiladas. Prez: I would concur. If somehow I could unite the enchilada with the chimichanga. I could perhaps order them from the cart... What? LOM: I think it's the #7. Prez: It may well be. Prez: I also used to like the Hooter's on Riverside. LOM: Well, it's more of a national chain. Prez: Yes, but I found their buffalo wings to be delicious. LOM: You know, I tried to tell Jamie that, but she thinks Hooters is some PG-13 nudie bar. Prez: I can understand that. I can understand why Jamie might have false ideas and misconstrusions about Hooters. But as her commander-in-chief, I can say, to the best of my knowledgability, that Hooters is just a sports bar chain. A chain with delicious wings. Prez: I cannot say the same about Sugar's Cabaret. Prez: Did you see Kill Bill yet? Prez: It's based upon movies that they call "grindhouse." I have never been to a "grindhouse," nor has anyone else. Yet, I love Kung-Fu and all manner of the Asian Martials Arts films. At times, I would go to Vulcan Video, and I would want to rent these films. LOM: Those guys at Vulcan are bastards. Prez: And yet they have a fine selection of all manner of films. I like that Jet Li. LOM: Yeah, he's pretty rad. Prez: We should go. Go and see Kill Bill. Prez: I'll tell my security detail to get us some tickets. LOM: I want Hot Tamales. Prez: Me, too. Hot Tamales and a Dr. Pepper. LOM: You're all right, Mr. President. I'd like to get excited about this story in CNN (sent to me by my beautiful wife, Jamie), but I read Flash comics, and everyone knows that you don't want a monkey getting any extra sensory powers. Okay, folks... this week our Halloween Contest will draw to a close and sometime next week I will announce the winner. It's not too late to get your votes in for what you believe is a movie so scary, upon watching it, I may darn well poop my pants. Rules for the contest can be found here. Don't forget to include a Snail Mail address for your prize, should you win. Now a few years back I heard some good things about a movie called The Haunting. I had seen House on Haunted Hill, and I thought that was pretty good. I like kind of schlocky horror films with rubber skeletons and stuff. Associating this with that, I went out and found the 1963 version of The Haunting and settled in. Hopefully, should you ever see this flick, it will surpass your expectations. It certainly surprised me. It's not all rubber bats and puffs of smoke. Somebody did some real work and figured out how to be genuinely scary. It will be to the eternal detriment of the original that somebody funded Jan De Bont's Epic Disaster (and this after Speed 2...). A lot of people have seen this "remake" of the 1963 version of The Haunting, and based upon the travesty they may have witnessed, they will never give the original a shot. Which is a shame, because I've seen my fair share of scary movies, and this one is probably in my top five. Almost nothing appears in the way of special effects in the 1963 version... Rather, sound design, lighting, convincing acting and a sound script work together to convey the aura of horror. There are no badly animated ghosts. No superimposed illusions. For people who are deadly tired of horror movies relying on CG these days (and becoming, by default, supernatural action movies), this movie may be a good outlet for you. THe 1999 version had it's good points. I think Lili Taylor tried as hard as she could to save that movie, despite the bad direction, hoaky CG and performances by Liam Neeson and Zeta-Jones that looked like they were constantly plotting their next snack break instead of the scene... Poor woman kind of disappeared after that movie, didn't she..? The 1963 version is a classic "have to spend the night in a haunted house" movie, but it does it well. And, sure, it's an early 60's movie, so there are some stylistic issues and whatnot, but Robert Wise directed The Sound of Music shortly after this film, and so one can imagine that they don't exactly have a slacker at the helm. Anyway, this is my official entry into my own Halloween Contest.